Imagine a barrel with a tap near the bottom and a second tap three quarters the way up. The fluid will flow with different pressure and volume depending on which tap you use. Now lets take that idea to a pickup. This guitar includes a Seymour Duncan -Shop Floor Custom STL-2T Hot Lead "Tapped" bridge pickup. What this pickup offers is a wire from the coil taken out at the same number of windings as a vintage pick, giving you that nice vintage sound. But it does not stop there. 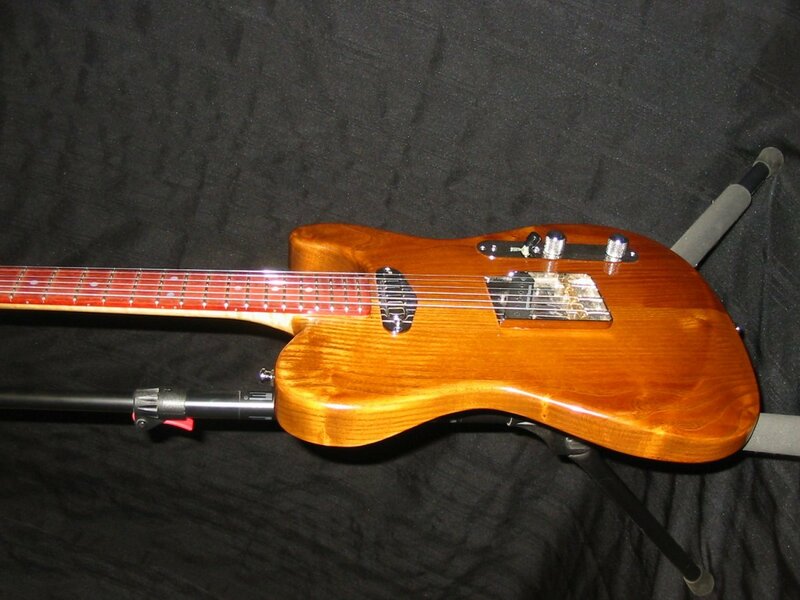 Additional winding are added to "overwind" the coil, and includes a second output wire with that hotter rock and blues tone of a contemporary Telecaster. Control of the tone options is by use of a push/pull/volume thus maintaining an uncluttered look. The neck pickup is the Seymour Duncan Alnico II Pro for a perfect paring. Finally, the pickup selector switch is an unconventional 4-way blade switch with Neck / Parallel / Series / Bridge positions. Remember that of these pickup selections, all the but neck position have a Vintage and Overwound tone option, giving a total of seven tonal choices. Effectively this is two guitars in one. So lets talk about Red Mulberry (Morus rubra) from Eastern North America. Yes - those same trees that you can reach up into to pull the fruit off and pop into your mouth. That delicious fruit that looks like a raspberry. This is the tree from which the body of this guitar is made. This wood is hard, quite heavy, with a grain and texture that looks, feels, and works a lot like Ash. However, this wood is bright yellow when freshly cut and then turns to this rich warm golden brown as seen here, with a nice 3D effect generated from the medullary rays. It is also an overlooked tonewood in the same Family (Moraceae) as Osage Orange - which is one of the top tonewoods on the planet rivaling Brazilian Rosewood. The fretboard is also another Moraceae, this time Bloodwood (Brosimum paraense) from Tropical South America. This wood is often used for backs and sides on acoustic guitars. It is also an outstanding fretboard material because of its resonance, smooth grain, and extreme hardness. This wood also immediately grabs attention with it's natural deep red colour. 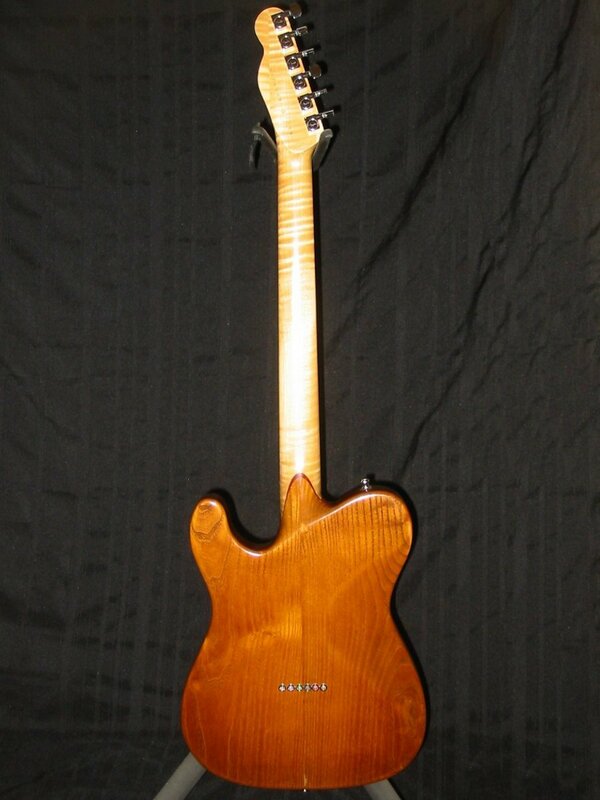 The neck is good old Canadian Sugar Maple showing a AAA grade Flame figure and perfectly straight grain. 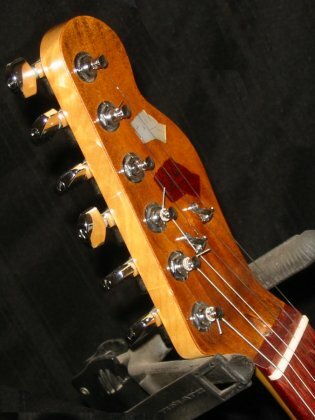 Further design elements include the sculpted heel of the set neck, giving completely free access to the highest frets and all the way across the neck at fret 22 on the 6th string (D). 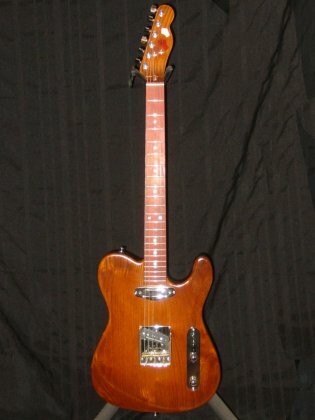 Combining the selection of woods along with the set-neck, this guitar rings and rings with sustain matched by few others. The body also includes the arm rest and belly cut-out like on a strat (fat guy tele). 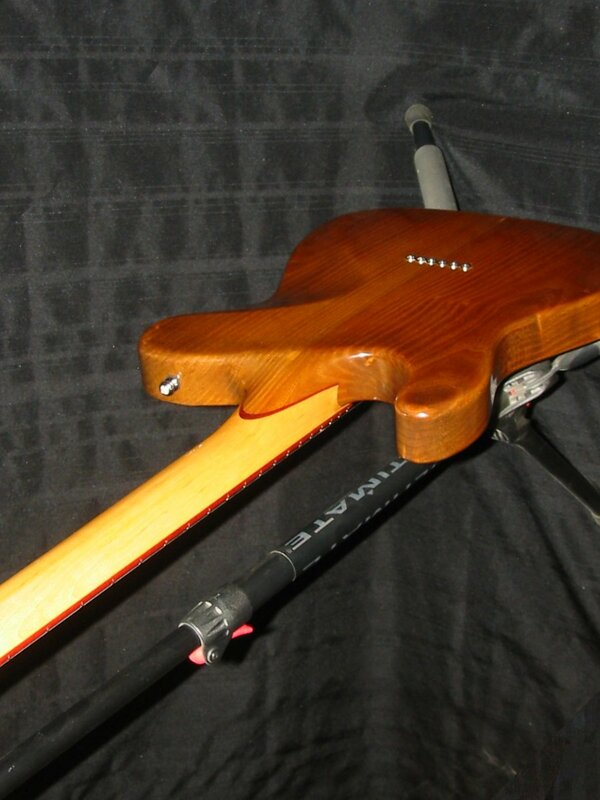 One common criticism of tele's is the saddle design. The Fender system first used (and still demanded for tradition sake) is with three brass barrels, were two strings cross each barrel. 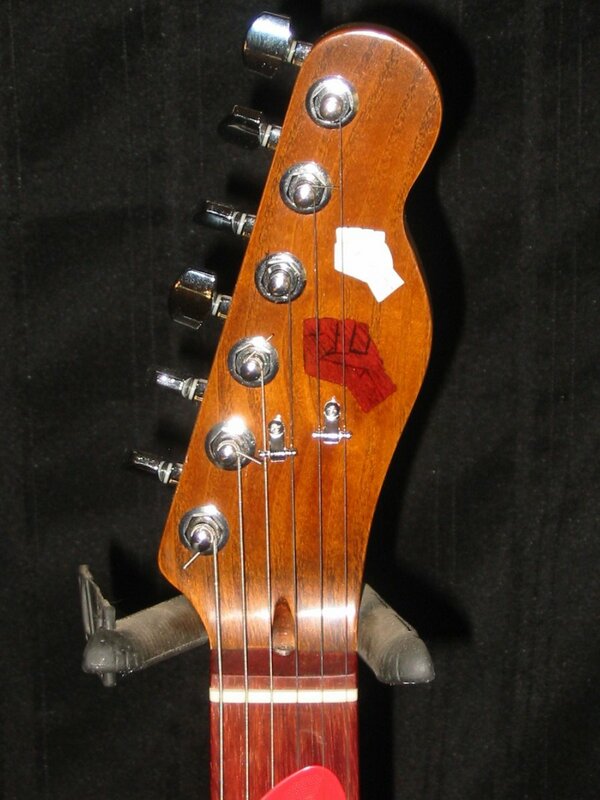 Because the string compensation length can't be independently adjusted, the intonation is often quite bad. In contrast, the bridge used here is the Joe Barden upgraded design with heavier steel plate material, and with angled threading through the brass saddles. This angle is the key. Each saddle is set at an angle that allows for the perfect compensation distance for each individual string, allowing for perfect intonation, yet maintaining the classic squawk traditional brass saddled tele's are known for. With its fit and feel all it's own, top tone woods, upgraded hardware, extended tonal options, killer sustain, and it's unique look, what you see here is a tele like no other. From clean jazz tone, through rockabilly, or country, to in your face Rock, this guitar is two guitars in one.